Already geared into Day 2 of the Road Safety Week, a lot of the ‘I THINK’ and ‘I FEEL’ has been going around, though they are great contributors, but nothing serves better than real data and Analytics to understand the real state. These India traffic safety statistics are not just an eye-opener, it will also make one get up and take notice of what’s going on around them. In terms of accidents on road categories, the national highways accounted for 30.4 per cent of total road accidents and 36 per cent of deaths in 2017. Accidents on state highways and other roads constituted 25 per cent and 44.6 per cent respectively. In case of fatality, state highways and other roads accounted for 26.9 per cent and 37.1 per cent, respectively. At a certain point of time we just look at “that one accident in the passing” however the ground reality is that the number of accidents happening nationwide are much larger than it meets the eye. 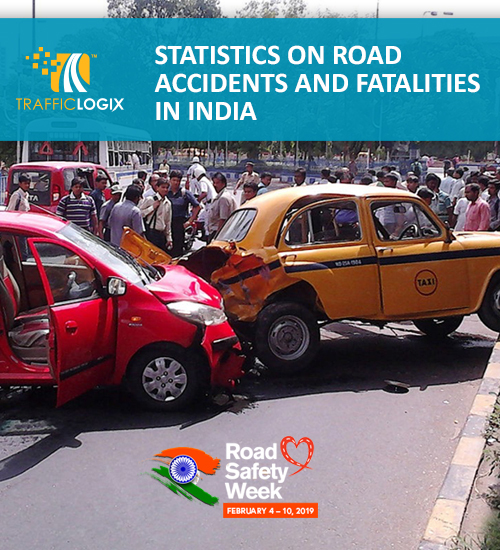 As per a recent research study, India is the only country in the world which faces more than 15 fatalities and 53 injuries every hour as a consequence of road crashes. These statistics are huge and should be written in big bold font on the roads, highways, walkways, sidewalks, billboards to make their presence felt. A regular count of rising accidents, if made aware to the drivers and Pedestrians may prove worthy to alarm of the rising numbers of accidents in India. Perhaps that’s when we will all wake up and take cognizance of the situation and realize that many of these accidents could have been averted with just a bit of alertness, awareness, caution, discipline, patience and consideration. Nowadays, we have the SPEED AWARENESS SIGNS along the roads constantly reminding us of the speed limits and cautioning if the drivers cross the threshold along with safety messages. One person’s carelessness could endanger the lives of several others. It is ironical that these statistics are seldom brought to the forefront. Maybe giving out Traffic Challans with a message printed “I could have been the nth person causing this accident because of my disregard for traffic norms” would underline the importance of traffic rules in the country. Let us all in general know with each Traffic Challan issued that how many road fatalities or accidents are on the rise each day. Till we don’t have each one involved and engaged the road safety scenario is not likely to change anytime soon. Here is for you some more facts and figures that promise to get all your attention. Make sure you have your seat belts on as we race through the data, trivia, facts and figures. India is the only country in the world which faces more than 15 fatalities and 53 injuries every hour as a consequence of road crashes. Over the decade road accidental fatalities in India have increased at the rate of 5% per year while the population of the country has increased only at the rate of 1.4% per year, National Crime Records Bureau, Ministry of Home Affairs, Government of India. In New Delhi, the frequency of traffic collisions is 40 times higher than the rate in London, the capital of the United Kingdom. Despite having 99 million fewer people and fewer vehicles, the number of deaths in road accidents in India is more than twice the number of people killed similarly in China, according to a government report. Two out of five road fatalities in India are caused by over-speeding: 56,529 people or 41% of all deaths in road accidents. 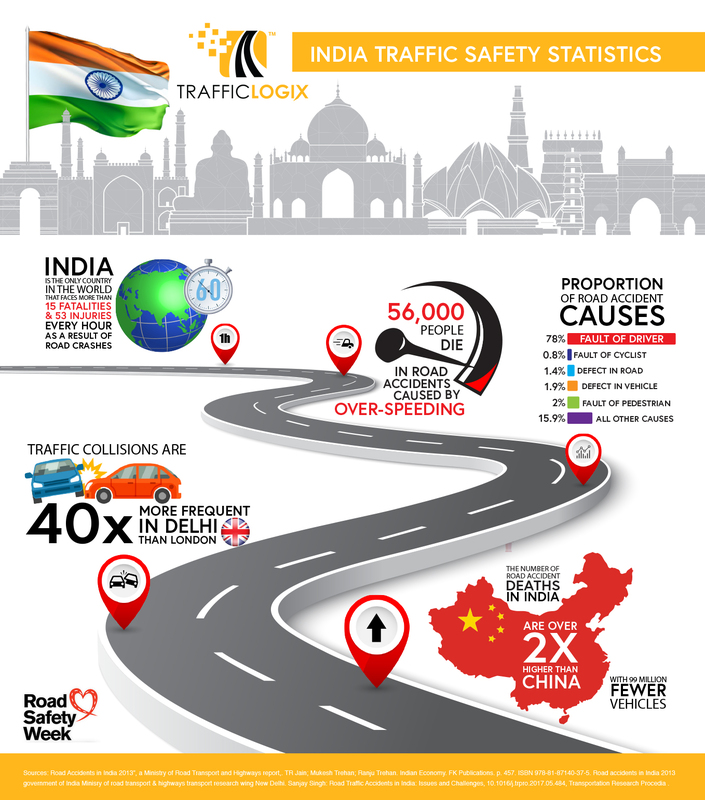 PreviousPrevious post:Traffic Logix Celebrates India Road Safety Week – CEO MessageNextNext post:5 Road Safety Tips for Indian Roads – How Many Do You Follow? Slow-Down To a Smarter Drive With The Most Safe Traffic Calming Solutions.